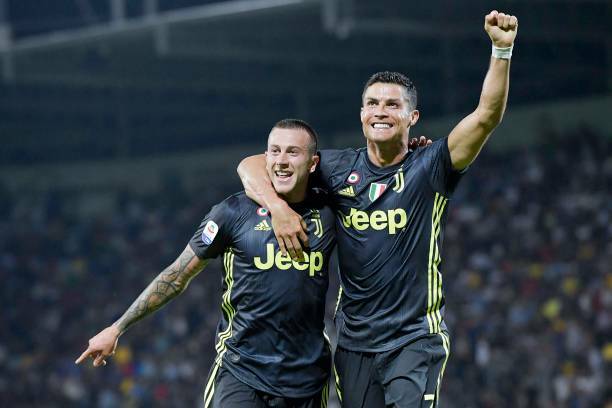 Portugal star Cristiano Ronaldo open the deadlock for Juventus bounce after scoring a late goal in a 2-0 win away to Frosinone Calcio on Sunday night. Cristiano Ronaldo had a dissapointing Champions League night on Wednesday following his dismissed in Valencia after only 29 minutes for an off-the-ball clash with Jeison Murillo. The 33-year-old did not take the decision well as he emotionally made his way off the field. However, Ronaldo have bounce back from moments of disappointment, and Ronaldo is no exception as he claimed an 81st-minute opener for Juventus in their following game against Frosinone. With the league game goalless, Ronaldo rapidly reacted to a blocked effort on goal by firing a left-foot shot past the goalkeeper and into the bottom right corner. The goal, while nowhere near the best of his glittering career, looked to have meant a lot to him as he sprinted jubilantly into the corner before he was pounced on by his teammates.